Another great find from Victoria Beckham at Target. I RAN to the store when I realized that her line finally released. And you know what I found? Hardly ANYTHING! It was all gone before I even got dressed in the morning. WAH! The early bird and all that jazz. Anyway, I did manage to get two pieces that I totally love. I already shared the first image – a fab floral mini. 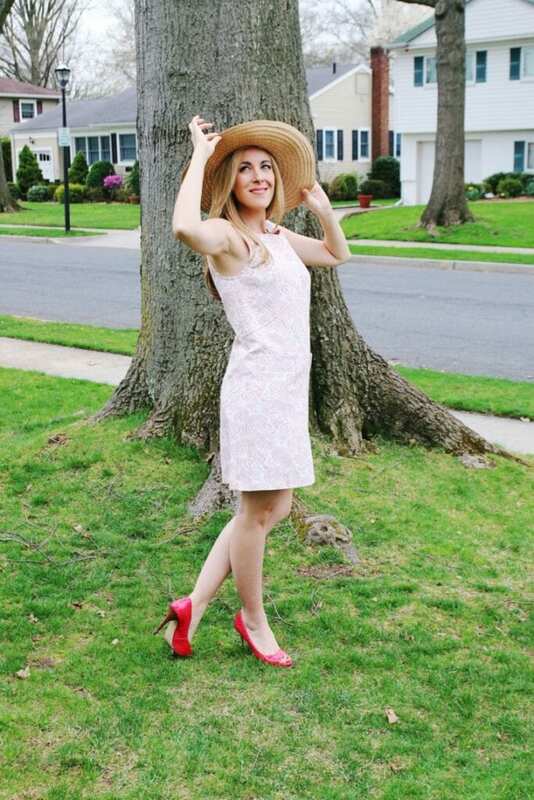 Today, I’m sharing the Blush Floral Jacquard Shift dress with pockets. It totally reminds me of the 60s and my mom. A real English vibe! Retails for $40! For shoes, I went with hot pink peep toe heels. Super fun! And don’t forget an oversized straw hat. This is the latest addition to the #50DressesForSpring collection! To see all the looks I’ve posted so far, click here. To check out what Audrey posted today, visit her site.